There are time in ministry where we need to get our hands dirty and work IN the ministry. It is all part of it and it is important for sure. There are times in which I am grateful for, and of equal importance, is to work ON the ministry. Working IN is going to games, go out to lunch with volunteers, go to coffee with students while working ON is working through the vision statement, working through volunteer processes, and working on the establishing the values of your ministry that will only help out in the long run. Recently, I have been able to work ON our ministry and I have been listening to Craig Groeschel’s Leadership Podcast where he has been talking about setting culture and values. In our ministry we have been working through our vision statement and have made some adjustments to it and now we are working through our values. I realized through listening to this podcast that we did not any of our values written down, let alone knew what they where. So this past week we began the process as a team to start to nail down the values in which we filter and do ministry. Your values set your tone in your ministry. Having a good tone is important because everyone will feel it. I believe it is really important to nail these down. If you don’t know what you value, I feel you’re just doing things to do them. If you have a set of things you and your leadership team values, we can always run through the things we do and point them back to the things we values to help determine if we should do those things or not. If something comes up and it does not go with what you values, you don’t do it. If something comes up and it goes along with the things you value, then you know you can move forward with conviction. It could be a fun exercise to do with your team, volunteers, core students because it was for us. We just sat around and began to list out the things we value. We had to be clear in we can say we actually value something but we need to look at what our actions say we value. So as you see above, this is our list we have so far. Is this a lot? Yes, it’s too much. 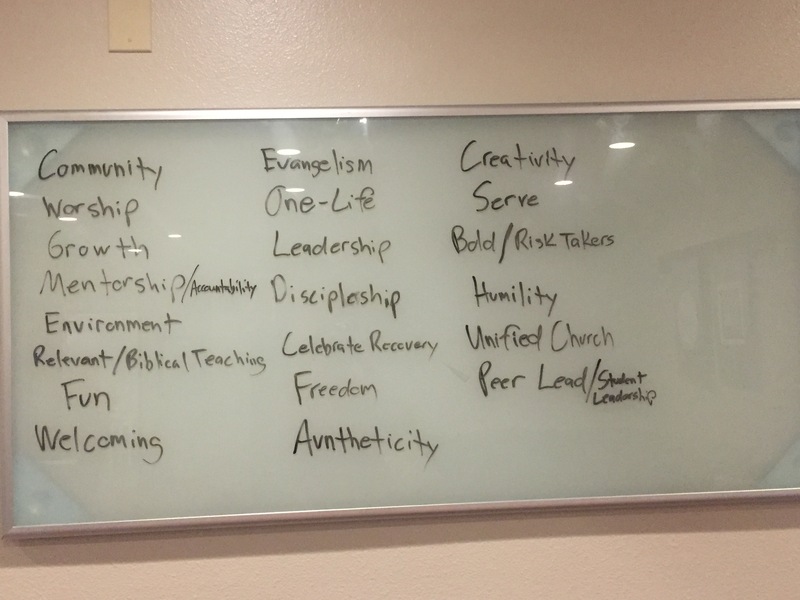 But I have emailed this to the team and now we will begin to narrow this list to 5-7 words in which we feel are the most important in our ministry which we will hash out in our next team meeting. It gives us something to look at to make sure we stay on track. If anyone where to question, “Why did you do that thing, event, series etc?” I can point them pack to what we value and tell them why. When we have a short list of what we value, it’s easy to share and easy for your volunteers to grasp and remember why we do what we do. Values set the culture in what you want and helps you keep it in check. What are some things you value in your ministry? Do you have a list?